It was such a nice day to work in the garden. Temperatures were in the mid to high 70s and I could here the bees buzzing around the flowers that were blooming in the backyard. 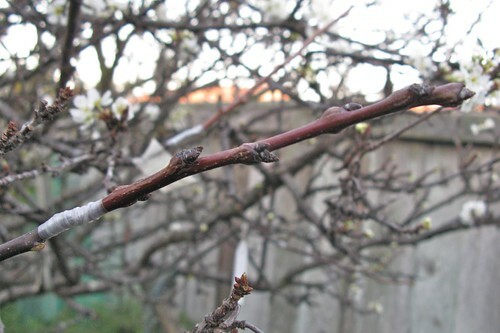 Some of the fruit trees, specifically the Plums trees, were starting to flower and bud, so it was time to start grafting. I took the scions out of the refrigerator and inventory of what I got. 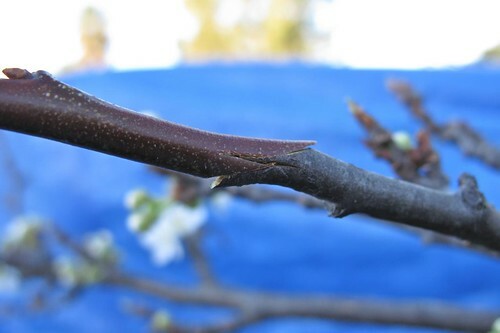 I collected the Plums, Plucots, Pluots, Apricot, Cherry and Avocado scions… found my grafting knife and grafting tape… got my camera and started grafting. I just updated the What’s Growing? 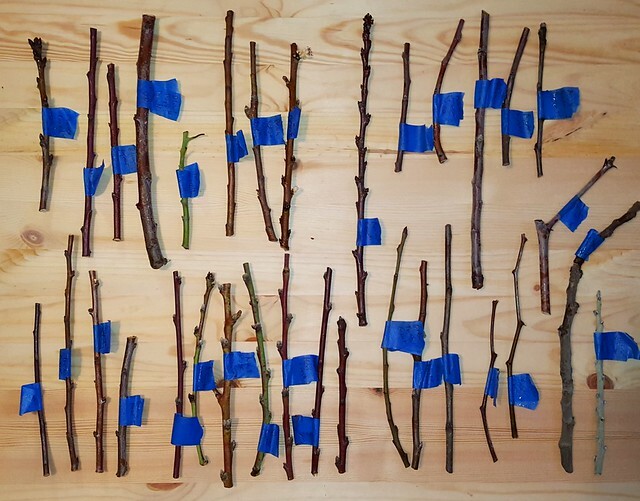 page and didn’t realize how many fruit trees we have until I listed them all down. Below is the list so far, not even including all the grafts that I have made. I started the day off harvesting some Swiss Chard ‘Green’ for lunch… My Mom used it in Filipino dish called Nilagang Manok, which literally translated means Boiled Chicken. I really love Swiss Chard, including the stems which remains firm when cooked. They are not stringy like some Bok Choy stems. I wanted to get rid of some really old seeds like the Sunflower above and I also found two packets of Radishes from 1984!!! I emptied the two packets (Radish ‘Red Deveil B’ and Radish ‘White Icicle’) into a 12 inch pot… I don’t really expect them to grow, but if any are still viable, here’s their change to grow. I planted a 10 inch pot with lots of Cilantro seeds that I harvested last year. I hope the Cilantro grows densely so we can harvest a lot. I then replenish one of the 3-gallon GeoPots that we harvested the Purple Bok Choy from and planted a bunch of Lettuce ‘Wildfire Mix’ that I bought a few days ago. I still had a bunch of seedling, so I potted to into large cell-packs to plant out later. I’m not sure where to plant the other new plants I got, so I divided the small-packs of Kale ‘Rainbow’ and Kale ‘Siberian’ into 3 inch pots, so they can grow a bit before I figure out where to plant them. I was surprise how healthy the young seedlings were. I was able to divide the Kale ‘Rainbow’ into 17 individual pots!! !… and I’ll give some away to friends and relatives. 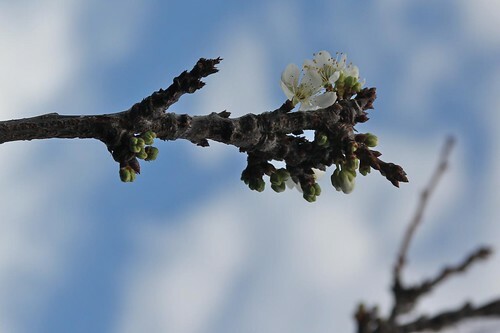 Last week, my Mom showed me that the Asian Plum (near the storage) is starting to bloom. 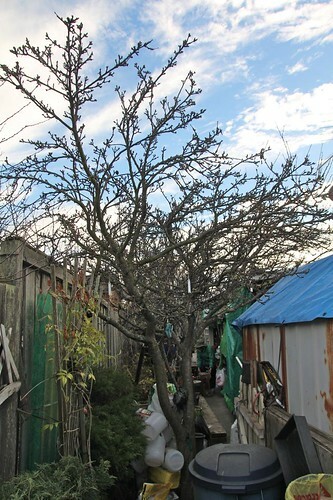 This Asian Plum tree is always our first deciduous fruit tree to break dormancy… This means that I need to start grafting to it… and I haven’t even sorted the scions that I got this year, so I have to do that soon. It’s kinda neat how this one tree now has Plums, Plumcots, Pluots and Apricots. 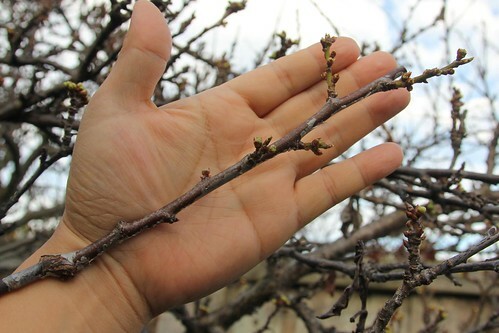 I also took some time to prune some on the limb back, especially the ones that hang too low or crossed other branches. My Peach ‘Stark Saturn’ graft (from 2008) is finally bearing fruits. 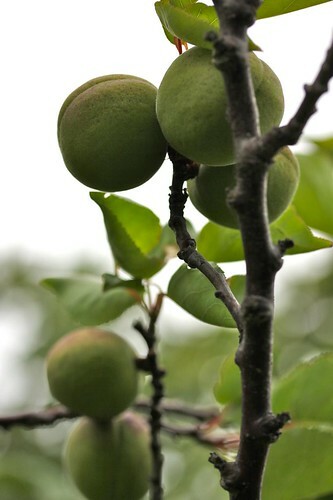 Below is one of the two fruits. 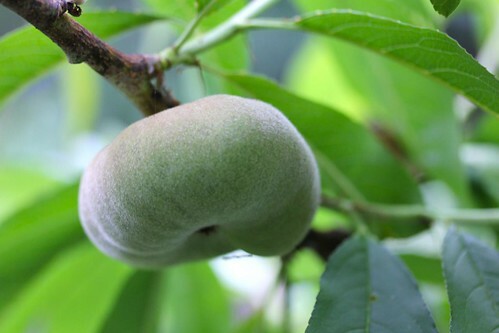 The Peach ‘Elberta’ that the Peach ‘Stark Saturn’ is graft to is not fruiting that much this year, but we still have a few fruits. 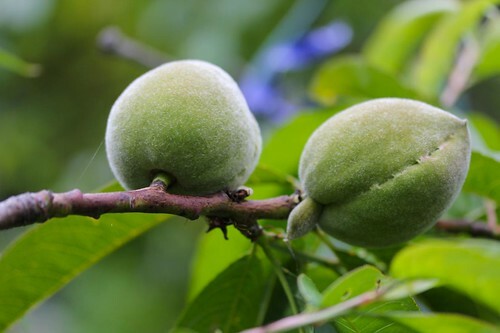 These two are young Peach ‘Elberta’ fruits. Our Apricot tree, on the other hand, has tons of fruits this year. 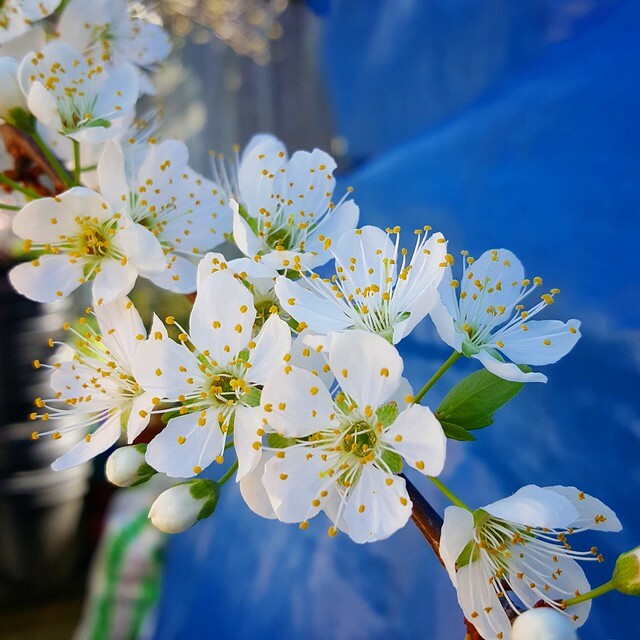 Our Japanese Plum (near the storage) is starting to bloom, so I started grafting some of the Japanese Plum and Apricot scion, which I believe are compatible to Japanese Plum.